Many people now have two or more computers at home and you maybe one of those. As many other people, you have only one printer, but you’re not the only one who wants to use it. What you may do in this situation? One solution is to visit a local computer store and buy another printer. But I suggest that you save those $100-200 for something better and share your existing printer with your computers. It’s no rocket science and you can easily do it yourself. I will consider a regular printer that doesn’t have a built-in network card, most home printers are like that. Let’s assume you already have computers connected into network, then sharing a printer is matter of several minutes. 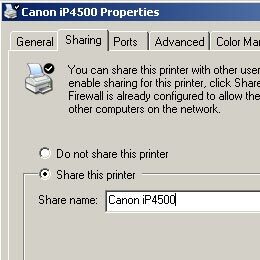 In this manual, I will explain how to share a printer in Windows XP network. Now you have to install printer software on other computers that need to connect to your printer. During the installation process, you’ll be asked if the printer is local or shared; Select “shared” and complete the installation. Congratulations! You have networked your printer with the computers. In this case you have 2 options: unite the computers into network and do like described above, or you can to connect a printer to computers through a switch. This instruction works well in Mac or Linux, not only Windows, so I leave out the OS-specific details. Please mind that with parallel switcher you may have to switch it manually to select what computer should use the printer. USB model are generally automatic switches. In your next step, you need you install the printer drivers and other software (optionally) on every computer to use the printer. Then plug the cables from the computers into the switch and connect the switch to the printer. Congratulations again! Now you know how to connect several computers to a printer in other way. This entry was posted on Friday, February 29th, 2008 at 6:58 am	and is filed under printer, troubleshooting. "How to Choose A Printer for Your Office"